You are here: Home / Long / Should You Use Heat or Cold to Treat Your Injury? If you have had an injury or are experiencing chronic pain, you may wonder whether it is best to use heat or cold to find relief. In this article, we will review the circumstances and symptoms you should take note of when deciding whether hot therapy or cold therapy will be most helpful to you. Read on to learn more. Generally speaking, if you are experiencing acute pain, or if you have an inflamed and/or swollen injury you should use cold therapy. It is usually best to use cold therapy during the 24 hours immediately following an injury. If your pain is chronic, or if more than 24 hours has passed since your injury, heat therapy is recommended. It is important to understand that these are just general guidelines and that they will vary depending upon the type of injury you have experienced. It is also important that you listen to your body. Regardless of the recommendations, if either ice or heat does not feel good, don’t use it! Heat therapy (aka: thermal therapy) relaxes your muscles and stimulates the flow of blood. That’s why it’s so good for sore muscles and muscle spasms. Whenever you stress your muscles, you cause a certain amount of inflammation and swelling. This decreases blood flow and the amount of oxygen available to the muscles. Without adequate circulation and oxygenation, lactic acid builds up and becomes congested in the muscle. This is what causes sore muscles. When you apply heat, it increases blood flow, relaxes the muscle and helps the lactic acid to move on its way. Heat therapy is also very good for treating chronic pain. If you experience recurrent or persistent pain, applying heat may help. Again, the reason for this is that heat promotes good blood flow and helps with the removal of toxins. The relaxing effects of heat help to relieve stiffness and soreness. Sometimes it’s a good idea to apply heat before you exercise to help prepare your muscles for your workout. You may find that applying heat after exercising worsens your pain. If this is the case, you may wish to try using cold therapy after exercise. What’s the Best Way to Apply Heat Therapy? To warm your entire system you might take a hot bath or shower or sit in the steam room or the sauna at your gym. Whenever you apply heat be careful not to overdo it. Don’t place hot devices or items directly against your skin. Instead, place some toweling between yourself and the source of heat. Be sure to drink plenty of water during heat treatment. This is especially true of systemic heat treatments such as sitting in the sauna or the steam room. If you have just injured yourself, ice is usually called for. When your body has experienced an injury, the tissue will immediately respond with pain, inflammation, swelling and redness. Ice can help to reduce this inflammation. Ice therapy (a.k.a. : cryotherapy) works by narrowing the blood vessels and slowing down the flow of blood. This helps reduce the buildup of fluid in the injured area. By controlling swelling and inflammation, cryotherapy can help relieve pain; however, it does not help to heal the injury. This is why it is best to think of cold therapy as strictly a form of pain relief. While heat therapy can help with healing in the long run, cryotherapy is best used to simply address the pain caused by an acute injury. As previously mentioned, cryotherapy can also be helpful for treating post exercise pain. It does this by reducing inflammation of swollen muscles. If you have a chronic injury that also causes acute pain, you may find relief by alternating heat and cold therapy. To do this, you would apply heat for 15 minutes followed by cold for 15 minutes. Repeat as needed. Freeze a damp towel in a plastic bag. Apply a bag of frozen vegetables. Apply a cold gel pack. For best results, you should apply cold therapy as soon as possible after experiencing injury or after intensive exercise. As with heat, you should be certain not to allow ice to come in direct contact with your skin. Be sure to have some toweling between yourself and the source of cold. Apply cryotherapy in sessions of 15 to 20 minutes in duration with a break of 5 to 10 minutes between. 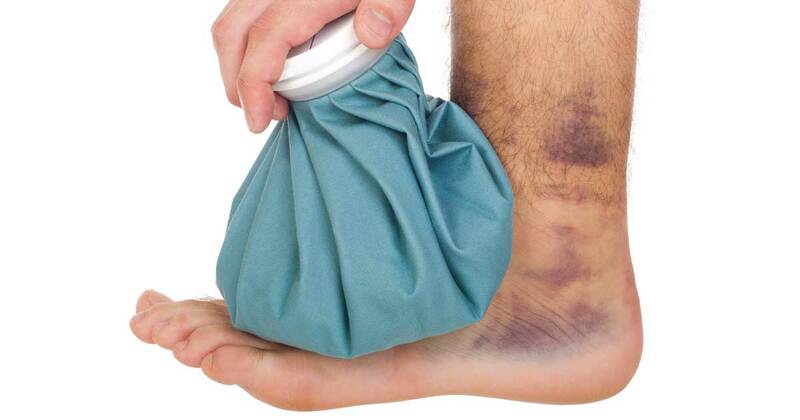 Don’t apply ice to areas of the body where you have limited blood circulation. If you use heat or cold incorrectly, you can cause more damage. Remember that if you are experiencing inflammation, such as from a recent injury, heat will make that inflammation worse. Keep in mind that heat promotes circulation, so if you have just injured yourself and you apply heat more blood will rush to the area. This will cause an increase in swelling and an increase in pain. If you are experiencing muscle stiffness, spasms and tension, cold can worsen the situation. For this reason, it is often a very bad idea to use ice for neck pain or back pain. Icing these areas can cause even more spasms and stiffness and worsen your condition. So in most cases, ice is for new injuries and heat is for relaxation and healing of chronic or recovering injuries. Immediately following an injury, you will want to ice the area for 15 or 20 minutes at a time throughout the first 24 hours. Following that, you may wish to switch to heat entirely or alternate heat and ice in 15 minute increments. Are Ice and Heat Really Effective? As an inexpensive, simple home treatment ice and heat are quite effective. The main thing is to remember when and how to use each. Just keep in mind that if you have just experienced an injury, you should reach for an ice pack. If you are experiencing chronic pain; if you want to warm up your muscles, or if your injury is more than 24 hours old, heat will provide soothing, healing and relief.